I had piano lessons at age 7, gave up because they were too hard. I am slowly trying to remove my stammer. A majority of the people I consider friends are people I met on the internet. learnt more about myself studying Psychology than any other period in my life. I can't whistle nor roll my tongue. Me too! Unfortunately I bought a Fender Strat as my first guitar ages ago, when I didn't know much about electric guitars. But if things go well in a year I'll buy my second guitar, and choose one with a sweeter and fuller sound. Cheers, Oudis. I am a hair dye addict… already this year it's been about 6 different colours. I am really close with my mom, we talk daily. I have been with my dude for 11 years now. We been "living in sin" for 8 years and are "happily unmarried". I love my Macbook, I don't care about the haters. They are superior IMO. I am turning 31 years old this month. I am currently quitting smoking for about the 15th time. Good luck on the quitting, you can do this! Thanks! It's been almost a month now. Just waiting for my dude to do the same. That's fabulous, LHL. The first three weeks are the toughest. If it's been a month, you are doing great. Take it from someone who quit smoking twice! Are you still keeping it up @LongHairedLady ? 1. I love Halloween/ Samhain despite my brother dying around that time.The first few years were difficult. 2. I live about 2 hours from New Orleans in the next state over. 3. Speaking of which, I survived Hurricane Katrina. Woo Hoo! 4. I have a hiatal hernia which means I can't have citrus based foods/ drinks, tomato base foods (ketchup is ok with me), large amounts of chocolate, caffeine, greasy food, spicy food, alcohol or tobacco, and I have to watch it around fried foods. Milk is my best friend. 5. I was addicted to coffee before I was diagnosed with my hernia. I still love the smell of coffee. According, to my friends I make a good cup of coffee. Not bad for someone who has not drank it in 6 years. 6. Tea is my new addiction. I have drank sweet tea most of my life, a southern thing don't you know, but this summer tasted different kinds of tea. I have slowly weaned off sodas. 7. I own three cats. They are like my family especially my oldest one. I have owned her for 11 years. I even evacuate them for hurricanes. 8. I found 2 of my cats near Halloween. Actually, one of them I did found on Halloween night while trick or treating. 9. I use drive for a living, delivering food. I love driving and going places. I have traveled to several states by car; however, I did not drive to most of them (too young to drive). Several people in my family have drove for a living. It must be in my blood. I have a hiatal hernia which means I can't have citrus based foods/ drinks, tomato base foods (ketchup is ok with me), large amounts of chocolate, caffeine, greasy food, spicy food, alcohol or tobacco, and I have to watch it around fried foods. Milk is my best friend. I take medication for it, course watch my diet, make sure I don't gain too much weight, and sleep in a upright position which is a bit strange at first. There is surgery I believe; however, the doctors feel that since I am pretty young it will close up on its own. It has gotten a bit better over the years because I have learned my symptoms and learned how to regulate. I hope it does close up on its own @Sky999, and I mean it. I can relate to your situation: I have a disk hernia (motorcycle accident) which bothers me a lot, and surgery isn’t an option (too risky). I also have a bad knee (another accident, this time because of, ironically, my Golden Retriever) and a bad ankle (a memento from the good old days when I practiced Martial Arts). I’m afraid I might end up using a cane. 1. Zombies really creep me out. 2. I have a birthmark that is shaped like a crescent on the tip of my pinky finger. 3. I slept in the Physics lesson yesterday. 4. I still use my iPod shuffle, even though I upgraded now. 5. I think Elton John is a little peculiar. 6. I broke my cycle chain last week. 7. My parents aren't entirely fond of my obsession with the Beatles. 8. My class teacher hates me. 9. I have a hat like Micheal Jackson's. "Time you enjoy wasting, was not wasted.” - John Lennon. @Sky999 Yes I am still quit! @LittleBeatlemaniac, what is your class studying in physics now? When will you get your cycle chain fixed? Thank you, I'm hoping it does too. I hope you don't have to use a cane. Is there any options for the knee and ankle injuries? I wish you luck. Well, my knee got much better after physiotherapy, and stretching regularly is important too. As for my ankle, after a year of conventional medical treatment I found the closest thing to a cure in acupuncture. Both injuries bother me every now and then, though. Thanks for asking, @Sky999. Hope it continues to work out for you, @Oudis. 8. Best experience was camp - even if it was educational (but we also got to do fun camp stuff, go to the movies, baseball game, dances, etc). Three weeks of hanging out with amazing people!!! 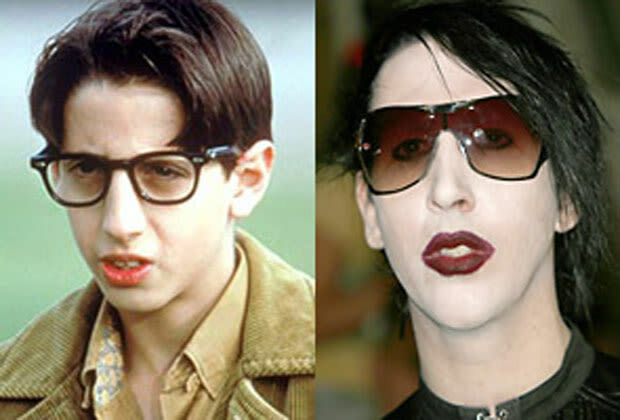 I could never find Marilyn Manson scary having grown up watching him play Paul in 'The Wonder Years'. Hard to take him seriously after watching him as a dweeb for so long. Oh, and his music was laughable. The cycle has gone for repairs. We're learning about Motion now. I'm not really a science person.